Hope is a steel drum to Lorna Green. The native of Trinidad and Tobago lures Washington kids to stay in school and improve their grades with the promise that they can learn to play steel drums. But to be a part of Green’s Cultural Academy for Excellence (CAFE) and to perform with the Positive Vibrations Youth Steel Orchestra, you have to have the discipline and commitment that serious music requires. You have to take part in the academic component—Green has recruited Howard University professors and other volunteers to teach history, math, and other subjects after school and on Saturdays. Only those who complete academic assignments can perform with the orchestra. CAFE students learn enough to sit for London’s internationally recognized Royal School of Music theory exam—they are often the only minority test-takers in the room. Since Green started the program in 1996 with a $7,500 grant from Kaiser Permanente, more than 600 kids, ages 10 to 18, have taken part. One hundred percent of CAFE’s students have graduated from high school, and 99 percent have gone on to college. The orchestra has performed from South Carolina to Senegal and won the Virginia Beach Panorama steel-drum competition two years running. When Green was growing up in Trinidad and Tobago, nice girls didn’t play steel drums. But her daughter, Malika, went to music camp in the islands, she fell in love with the drums, and persuaded her grandmother to buy her a set. 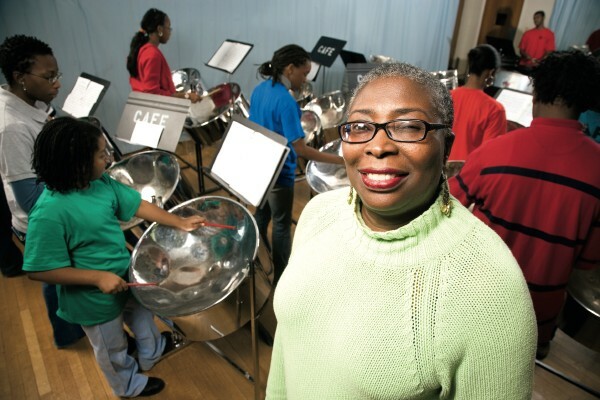 When she got home, Malika joined an all-girls steel band in Silver Spring. Lorna Green decided to start a band closer to home in Prince George’s County. The program began in her basement. Mitchellville neighbors soon provided space for the other classes. That young man is in college now, but his words are still music to Green’s ears. “We make these kids dare to dream and prepare to succeed,” she says.